Live Healthy Lynchburg strives to connect our citizens to the array of resources we have in Lynchburg and the surrounding area to support health. 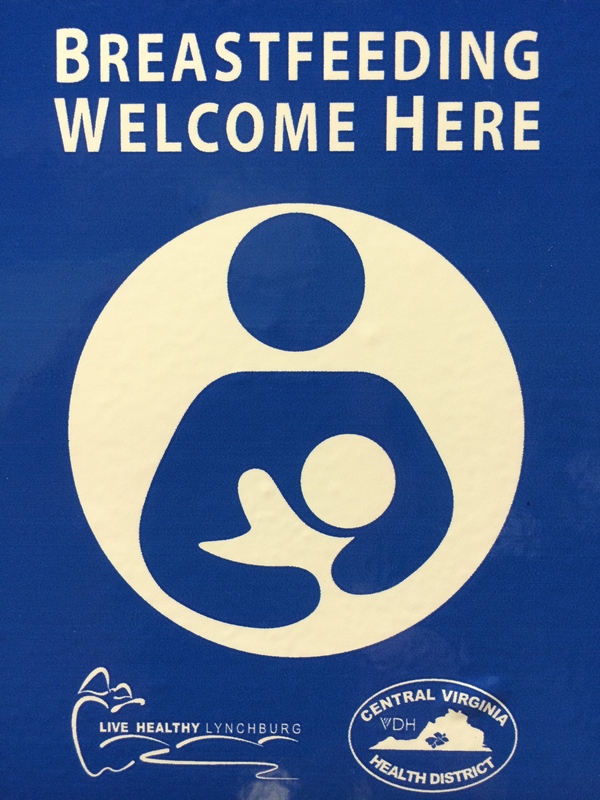 Breastfeeding Welcome is a project designed with support from the Virginia Department of Health and in coordination with Centra Health who in 2015 were designated as a BabyFriendly Hospital (only the 3rd in the state of Virginia!). We know that 90% of mothers are breastfeeding their babies at discharge from Virginia Baptist Hospital. We know that breastfeeding significantly improves the health of both babies and mothers (go HERE to learn more! ), it is ecologically and economically advantageous, and yet it requires tremendous support. Live Healthy Lynchburg is promoting breastfeeding friendly venues so that women can feel more comfortable breastfeeding when out and about. Posting our “Breastfeeding Welcome” sticker gets a business listed here at http://www.BFintheBurg.wordpress.com as well as advertised on main Live Healthy Lynchburg website and on our Facebook page. With tireless efforts from volunteers, we posted 100 stickers in 2015! We have continued to post stickers over the past 3 years! Let us know if you are ready to post a sticker at your place of business! * Breastfeeding is acceptable in all areas of the business premises that are open to the general public. * A mother who is breastfeeding will not be asked to stop or to move to another area. * Employees will treat mothers breastfeeding with the same courtesy as a mother bottle feeding. We are thrilled by the support from our community for this project. Special thanks to our volunteers from The Motherhood Collective! If you are interested in starting a similar project in your community, you can! For advice and encouragement, feel free to contact us at livehealthylynchburg@gmail.com!